Shazmina Bendi designs......: mmmmmmmmmm, Clapotis! THE YARN arrived on Tuesday, and I was in love. I am putting it out there. This is my favourite multicolour yarn! EVER! I love everything about it. All the colours, the way they gradually morph into the next are stunning. 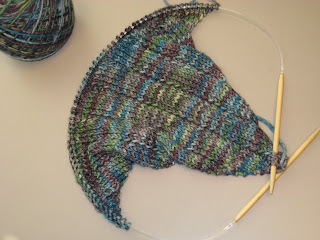 I love it sooooo much that I am OBSESSIVELY knitting my Clapotis! That actually may have more to do with the cold weather we are having in Sydney and my INTENSE desire to have this Clapotis finished and wrapped around my neck. I can not describe how wonderful this colourway is. It is so beautiful that when I showed my friend, the Obsessive Compulsive Craftster, she wanted to make herself a Clapotis out of the same yarn. Under the circumstances I would have VIOLENTLY objected. I mean really, who wants a friend to have the exact same scarf as yourself? But the dear OCC is moving to the UK in 6 weeks for a couple of years, so deep breath, I am ok with it! And she was so in love with the yarn that after seeing it at lunch, she went back to her office and ordered 4 balls for a Clapotis and matching beanie! OCC has been my lunchtime knitting companion for the last 18 months. I am going to miss her when she is gone, so it is nice to know that we will both be wearing the Clapotis made from Daphne's delicious Earth colourway. As long as she only wears it in the UK, 'cos I have first dibs on wearing it in the Southern Hemisphere! Go clappy go! I felt exactly the same way - it was one of the fastest (large) things I've knit in ages! It looks great! Oh that colourway is just gogeous! Ive been loitering with intent at the knittery for 2 weeks now, trying to decide on a colourway for a clappy of my own...but dont worry, I'll steer clear of earth! I'm not surprised you're totally obsessed - seems a perfectly reasonable response to me! Go Shazzy Clappy! Yay! I hope you can make it on Sat so we can ooh and ahh. Well, no wonder why you are in love with this yarn! It's absolutely brilliant for the clapotis! Give Me the Sock Love Meena!!! My name is Shazmina, and I am a Yarnaholic!